Welcome to week 3! 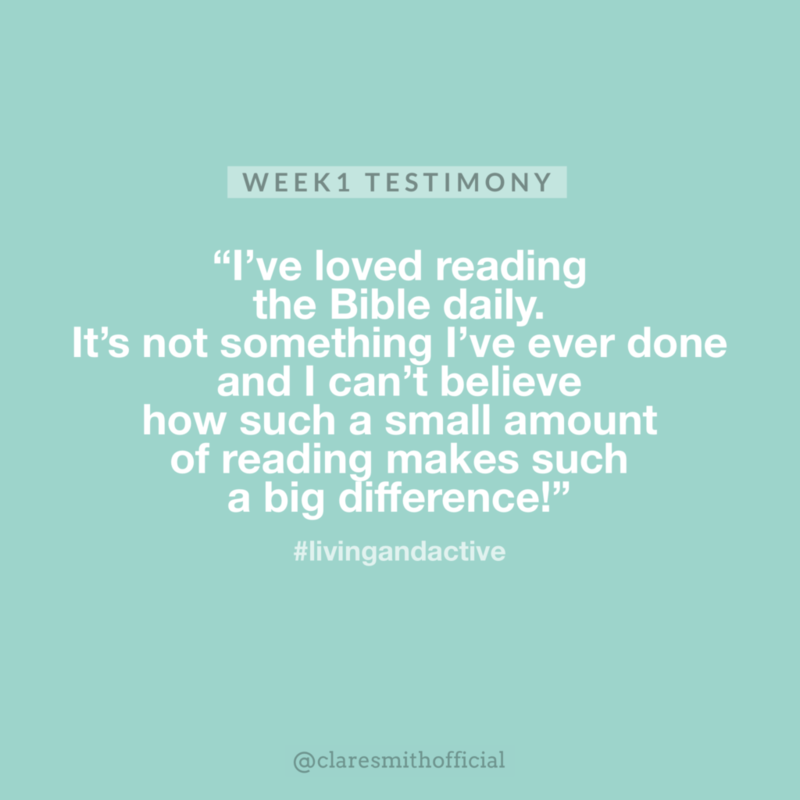 I love this testimony from last week. Time to check in from week 2, then we will move onto week 3 info. Now, let’s get to Week 3! 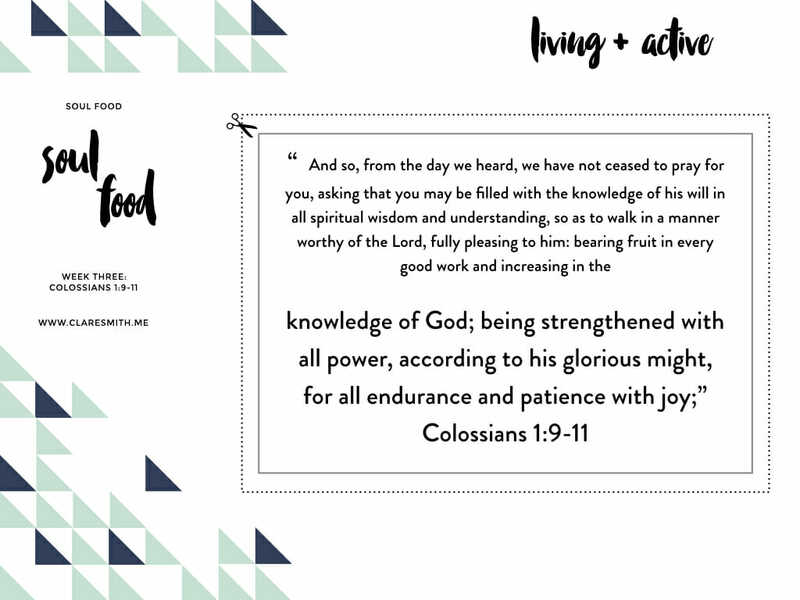 Remember, don’t forget about your soul food and focuses from the weeks prior! It’s a good idea to keep reviewing them so you really have them committed to memory! Also, be sure to check out Lysa Terkeurst’s book, “Made to Crave“! It has so many wonderful keys to helping you “satisfy your deepest desire with God, not food”! 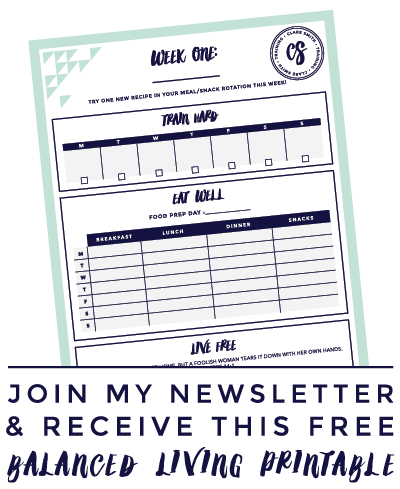 I love this FREE PRINTABLE Lysa provides giving us “Healthy Eating go-To Scripts”. Print it out and pray over them! 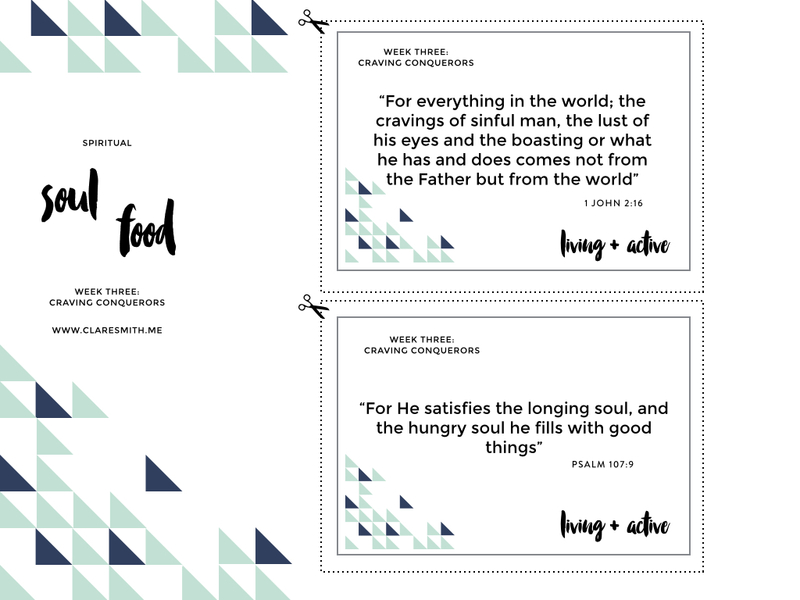 We will have a guest post on Wednesday talking about the very issue of conquering cravings! But for now, here are some of my thoughts! 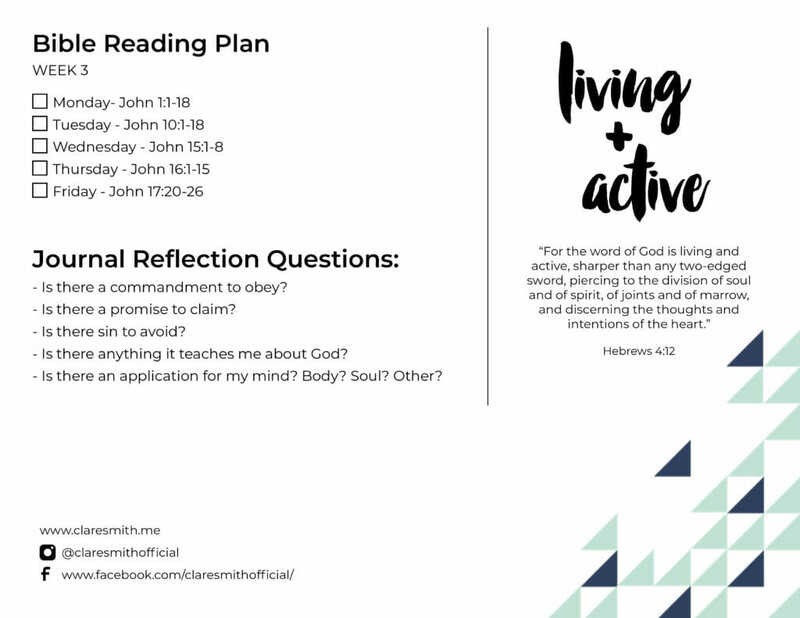 Bible Reading plan: Click here for the pdf version. Next week I will provide a new set of suggested exercises for those of you who need it! Until then, keep up with what I have or what already had in place! So we are building on each week: water, meal prep, and I bet you have a good idea of what this week might be considering our key topic! That’s right—No sweets! Well, actually, not technically right there because I want you to go about it a different way and limit them for the rest of our challenge! All the details in the image below. This challenge is totally doable even if you aren’t part of the challenge! Feel free to comment below with anything you’d like to tell us. Remember–we are a COMMUNITY who are TIED TOGETHER and DAILY DEDICATED, so let’s spur one another on with our personal stories! Find me on facebook, twitter or instagram for daily insights, pictures and encouragement! Thank you clare! 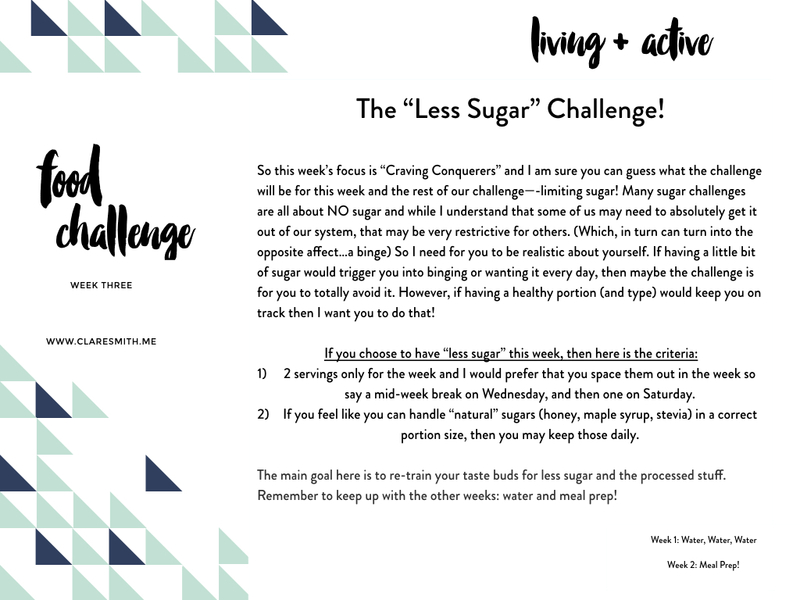 As I said in my check in, I didn’t successfully complete the challenges for this past week but I had lots of high points (meal planning like you encouraged helped me to make better food choices and I spent time in the Word everyday) and I’m not going to give up just because I didn’t complete every aspect. I tried to enter my check in for the week, but there’s no ‘submit’ button. I did my work last week! Hello! I am loving this so far. 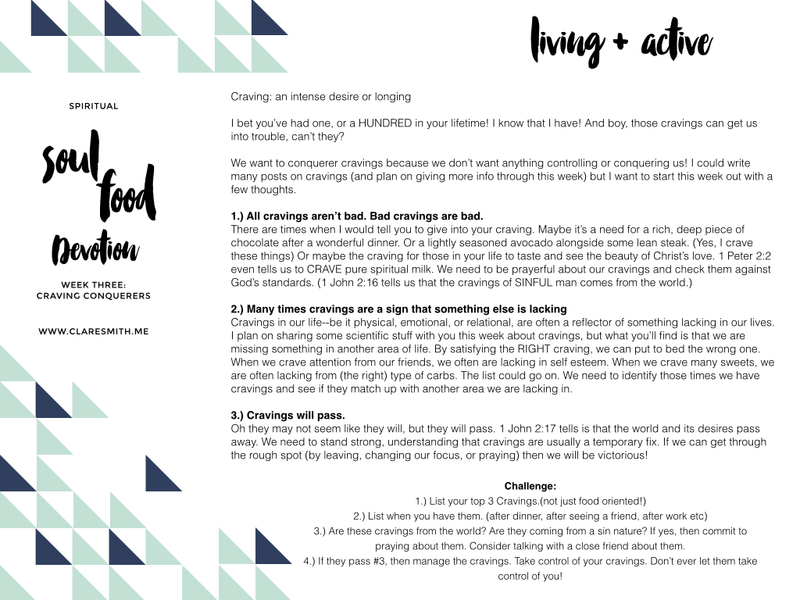 I’m not going to lie…it’s hard to get everything in order (eating well, meal planning, working out regular, actually reading my Bible regular) when I basically had NONE of that in order in my life! My personal goal is to continue these things after the challenge. That will be a real test for me.